I realised something last week, which is that sometimes we actually have to bite the bullet and ask for help. This might seem obvious for some people, but it’s been quite a new concept for me; so, I’ve spent the last 10 days very sick and finding all sorts of different ways of asking for help, and do you know what, it’s not so bad. so I thought I’d post some pictures to inspire you to ask for help too. If you feel guilty about asking for help, look at it from your family and the people you ask’s point of view. Your family just want you happy and being yourself. The people you ask will either earn money, or feel that they are worth something, because they have been asked. When the in laws came to help out, it was brilliant for their bond with the kids. 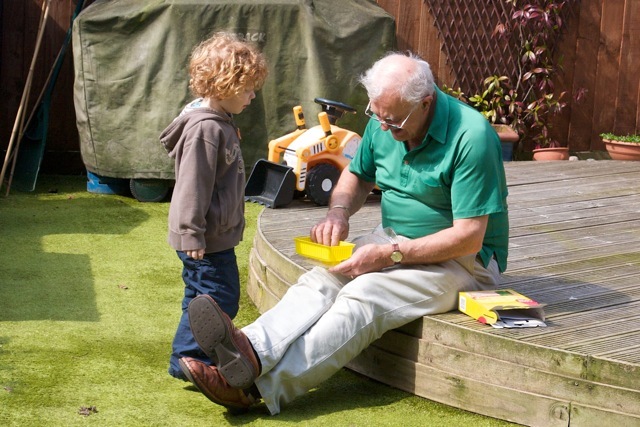 My 4yr old son and his granddad really bonded, with his granddad appearing to come alive and become really fun. Meanwhile, my baby girl was very comfy and secure on her grandma’s shoulder. Grandparents are important to children, and it’s even more important that they themselves understand this, because it gives them a reason to be. It might have been tiring for them, but having a ‘reason to be’, keeps us going, gives us purpose, and boosts our health. They probably hadn’t realised until now how important they still are to the growing family. Memories were created over the last couple of weeks, that will stay with my kids forever, thats a great thing and worth getting sick for. So if it’s a family problem hows about asking a friend/ neighbour/ relative? Is there someone you have helped in the past, who is really keen to get the opportunity to help back? Is there an online forum or community that can give you some info? There are many specialists out there on the net, who are happy to give quick and free help. You can pay for help or for people training up e.g. 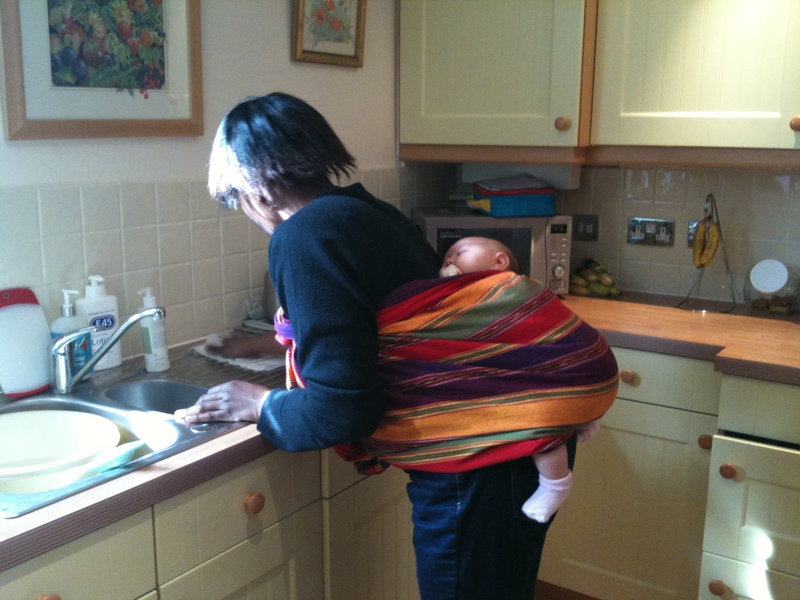 there are Au Pairs, Au Pair Plus (older, more experienced, do more cleaning), Mothers Helps, Nannies, Child Minders, Day Nurseries, Cleaners, Dog Walkers. There are even alternative and medical options, just to help you get through the day. For instance, I’ve been complaining that I couldn’t find anyone to help out with the last couple of hours of the day (see previous post about feeling guilty about asking for help), but I wasn’t actually asking, because I hadn’t actually put an advert anywhere. It seems I was weirdly expecting them to appear, just because I had thought about it, doh! Now I’m inundated with options. When the inlaws left, we asked a girl called Victoria to come and help us tidy the house. She’d interviewed for the job as a part-time mothers help, which we sadly probably can’t give her, but she did get a generous bonus for coming at short notice. Even better was that when my baby girl cried, she took one look at me (looking very lumpy and sick), and took her off me, popping her on her back: a truly amazing and lovely girl! Look at this picture of Willow happily asleep, just gorgeous. I’ve asked for advice on facebook and got over 40 comments, some incredibly comprehensive and time consuming for the people who filled them in. Now people love to give advice, but they often give it inappropriately, especially in my business, as us healer/coach/therapist types tend to get very enthusiastic and want to share all our knowledge with the whole world. But this was definitely a chance for extremely well received and appreciated information. Asking for help has shown me how lucky I am, in my friends, family, resources, connections; just everywhere. There are downsides or costs to everything, but if you think it through beforehand, you can manage them all. You won’t always get the response that you hoped for, so do try asking without expecting the ‘ideal’ response, and remember that you can always ask again or ask someone else. If I hadn’t have asked for help, I would definitely be sicker, and possibly in hospital as the only real fix has been lieing down. Now the cost of a showing a bit of vulnerability, paying some money, and learning how to ask for the simplest things to be done for me, has paid off. So don’t feel guilty about asking for help. Think about the people you ask and your family will gain from it. As they say ‘If you don’t ask, you don’t get’; so this isn’t rocket science, but I thought I would share anyway! (p.s. remember to say ‘thank you’ though, and look for times to reciprocate in the future, otherwise, you might not get such helpful responses another time). Thank you for this. Very nice to know others struggle with being vulnerable as well, especially someone who i’d otherwise compare superman with. and that it’s not always so bad to feel ‘weak’er than usual. Nice stuff, cheers. @grace – LoL, ok, something enroute for you!